Introducing new surgical techniques and concepts can be difficult. There are many hurdles to overcome initially, such as the learning curve, equipment and technique development, before a standard of care can be established. In the past, new surgical techniques have been developed, and even widely accepted, before any scientific evaluation has been made. At that stage, it may be too late properly to evaluate the effectiveness of treatments, as the objectiveness and/or randomisation process may be obstructed. Since the introduction of evidence-based medicine (EBM), there have been high standards of scientific rigour to prove the efficacy of treatments. 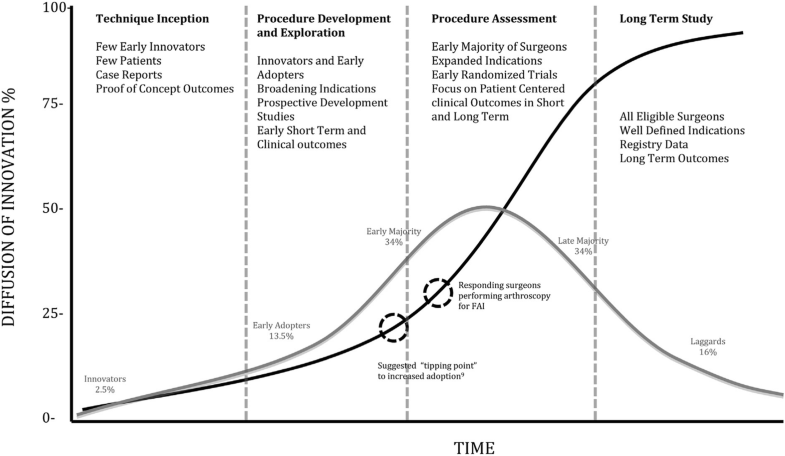 Based on the nature of evidence-based acceptance, innovations cannot be subjected to this final process before their evolution process is complete and, as a result, there is a need for the staged scientific development of new surgical techniques that should be adopted. This paper presents a model for this kind of stepwise introduction based on the actual evolution of FAI syndrome surgery. By following a scientific algorithmic methodology, new surgical techniques and concepts can be introduced in a stepwise manner to ensure the evidence-based progression of knowledge. A common pattern can be discerned in the evaluation of the historical evolution of new surgical techniques (Fig. 1). First, there is an idea or creation of a concept on which the treatment is based. Then, there are the initial innovators who apply the treatment experimentally to a few patients. At this stage, case reports may be the only scientific reports of these activities. When the new technique seems promising, a development phase takes place, driven by early adopters and innovators who broaden the indications, as well as developing and improving the technique. This phase can also be influenced by outside interests, which may include industry and which do not necessarily have to be aligned with those of the scientific community. At some “tipping point”, a new technique is either accepted by the surgical (orthopaedic) community or discarded, possibly due to a lack of perceived effectiveness or due to complications—too many or too morbid. After this point, if the technique obtains general acceptance in the surgical community, it spreads to all the interested surgeons and the indications are better defined. This process has been repeated historically, without having the necessary scientific evidence to prove the efficacy of the actual procedure. In 1972, Archie Cochrane described the lack of scientific evidence supporting many practices which were then considered to be effective . Pivotal ideas emerging from McMaster University, Canada, subsequently led to the emergence of the concept of evidence-based medicine (EBM). The vast majority of orthopaedic procedures that are used today lack high-level evidence for their use. Examples include anterior cruciate ligament (ACL) surgery and arthroplasty. In these procedures, the opportunity to perform high-quality, randomised, controlled trials (RCTs) is low, as patients are reluctant to be randomised to non-treatment when there is a widely accepted effective treatment. The RCTs performed in these examples suffer from a significant selection bias for these reasons. Since the introduction of EBM, there have been greater demands when it comes to the proof needed for the effectiveness of surgical procedures. Surgery can be resource intensive for health-care systems and governments worldwide and the effectiveness of treatments is, therefore, paramount to assess the need for funding. Furthermore, surgery always poses the risk of complications for patients and so reducing unnecessary surgical procedures is of the utmost importance. When introducing a new surgical technique or concept, it would, therefore, be of great value to follow a local or general model for scientific and clinical stepwise introduction. The concept of stepwise introduction was presented by Malchau et al. [26, 27, 28]. This concept was designed to explore the optimum method for the appropriate introduction of new implants in arthroplasty surgery. However, these ideas are also relevant to other fields of orthopaedic surgery, if not all surgical areas, even if special conditions apply to different areas. How can a new surgical method be introduced so that each step in the evolution of the method is based on the best available data to enable a safe introduction? This article will propose a method of this kind based on the actual development of femoroacetabular impingement (FAI) syndrome surgery. As early as 1933, Elmslie proposed that patients who develop hip osteoarthritis (OA) by the fourth and fifth decades of life may have unappreciated pre-existing hip joint deformity . The idea that impingement in the form of bone-on-bone contact in the moving hip causes pain and leads to a reduced range of motion was reported in 1936 by Smith-Pedersen, who performed acetabular rim trimming and femoral neck osteoplasty in patients with acetabular protrusion and a chronic slipped capital epiphysis . The mechanism involved in FAI syndrome was not fully appreciated until after the technique of surgical hip dislocation was established with the description of a safe approach to the hip joint that avoided avascular necrosis of the femoral head and allowed for complete inspection . Based on the dynamic evaluation and direct observation of more than 600 cases undergoing surgical hip joint dislocation, Ganz et al. proposed in 2003 that the pathomechanics of FAI syndrome will lead to OA. Since the first articles by the Bern group, hundreds more have been published on the diagnostic and therapeutic aspects, which have contributed to the rapid scientific advancement in our understanding of FAI syndrome. The Warwick Agreement on FAI syndrome was an international multidisciplinary agreement on the terminology, diagnosis and treatment principles . An article by Burman published in 1931, which described experiments on cadaveric joints, was the first time hip arthroscopy was mentioned in the literature . Later, in 1977, Gross described the diagnostic application of hip arthroscopy in 27 patients with a variety of paediatric orthopaedic conditions . Ganz was of the opinion that the arthroscope could be used for the debridement of labral tears, but access to the underlying causes of hip impingement was limited . Keeney et al. believed that the debridement of the femoral head–neck junction arthroscopically had potential disadvantages, including the potential for poor exposure, the inability to clear bony debris and the possibility of inadequate osseous resection. In response to these concerns, Clohisy et al. developed an intermediate approach, which combined arthroscopy of the central compartment with an open femoral osteoplasty performed using a limited anterior Smith-Peterson approach. Most of the initial studies of hip arthroscopy were limited to the treatment of isolated labral pathology . It was not until studies investigating the arthroscopic anatomy of the peripheral compartment that surgeons were eventually enabled to view the anterior head–neck junction of the proximal femur with the hip in flexion . This improved visualisation propelled the thought that an arthroscopic approach to the treatment of cam impingement was conceivable. At around the same time, evidence emerged from cadaveric studies showing no differences between the open and arthroscopic techniques of cam osteoplasty in terms of the volume, depth, or overall circumference of bony resection . In 2005, Sampson was the first to report on the arthroscopic treatment of FAI syndrome in a series of 120 patients . The author found that almost all the patients experienced the elimination of their impingement test and were “quite happy with their results”. Early studies of hip arthroscopy were clearly limited by poor study designs that lacked prospective data collection, randomisation and the consistent use of validated outcome instruments. The implementation of new outcome instruments that focused on young patients with non-arthritic hip problems would be instrumental in differentiating between the success of variable surgical techniques and approaches to FAI syndrome. In particular, the international Hip Outcome Tool (iHOT) and the Copenhagen Hip and Groin and Outcome Score (HAGOS) were patient derived in young active populations being treated for FAI syndrome and were thus more representative in this group [18, 30, 41]. Both have sound psychometric properties including test–retest reliability, responsiveness, content validity and construct validity. In 2013, the first prospective comparative study of patients with FAI syndrome treated with surgical dislocation or arthroscopy was performed with a 2-year follow-up. The change in the Hip Outcome Score (HOS)-Sport-Specific Subscale and the Non-Arthritic Hip Score (NAHS) was significantly higher in the arthroscopic group . During the 2010s, a number of clinical registries have been set up, from which numerous prospective studies have been published . In Denmark, a nationwide registry includes all the hip arthroscopies performed in Denmark . In 2018, a large prospective study of 386 patients undergoing the arthroscopic treatment of FAI syndrome with more than a 2-year follow-up was performed. Post-operatively, patients reported significant improvements in all patient-reported outcomes, with only a 1.2% rate of revision hip arthroscopic surgery and a 1.7% rate of conversion to total hip arthroplasty . Today, more than 50 prospective studies of the arthroscopic management of FAI syndrome, with varying quality, have been published [34, 36, 37]. Sackett et al. introduced the critical concepts of EBM and emphasised the understanding and improvement of the quality of research. The American Academy of Orthopaedic Surgeons (AAOS) has standardised this approach to research in orthopaedic surgery by creating an evaluation system adopted by The Journal of Bone and Joint Surgery . This system assigns a level of evidence (from I to IV) to research based on study design with RCTs classified as level I evidence and case series or reports as level IV evidence. The idea of this classification system is that a more rigorous study design would inherently have an outcome that is more reliable in terms of its clinical applications. A study assessing statistical trends indicated an improvement in the quality of clinical evidence presented at the International Society for Hip Arthroscopy (ISHA) Annual Scientific Meetings from 2010 to 2014 . However, the proportion of level I studies was not shown to increase over this study period. Furthermore, 58.1% of level I studies were prognostic and only 3.5% of all studies had an RCT design. Obstacles to executing RCTs in the field of surgery, particularly for novel procedures, may provide reasons for the marginal number of RCTs and why there was no definitive upward trend in their proportion . Several of these studies are currently under way and the results will emerge in the next few years (Table 1) [11, 16]. As of today, there are two published RCTs comparing the arthroscopic treatment of FAI syndrome with physiotherapy. Mansell and co-workers randomised patients from a military hospital to either arthroscopic FAI syndrome surgery or physiotherapy. 80 patients were included, but, after loss to follow-up, there were only 28 in the physiotherapy group and 33 in the surgical group. Furthermore, 70% of the physiotherapy group crossed over to surgery, leaving only six non-surgical patients with 2-year patient-reported outcome measurements (PROMs) to analyse. The study revealed no significant difference regarding PROMs between the groups, but, due to the above-mentioned circumstances, the quality of this study is ultimately fairly low, despite the initial rigorous randomised, controlled design . In the UK FASHIoN study, Griffin et al., randomised 348 patients to either arthroscopic FAI syndrome surgery or physiotherapy. They reported significantly better results in the surgical group regarding PROMs. However, the results show only a modest improvement, with mean iHOT-33 improvements from 39 to 59 in the surgical group and 36–50 in the non-surgical group and the follow-up time after surgical treatment was short . This highlights the importance of high-quality studies for assessing scientific evidence. With several RCTs currently under way and planned to be presented in the next few years, science relating to FAI syndrome surgery may reach evidence levels previously unseen in other orthopaedic surgical procedures. This could be due to the stepwise evolution of FAI syndrome science, as described in this article. 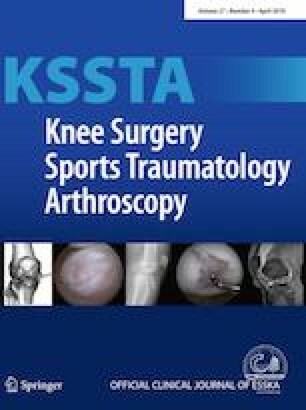 Based on lessons from the introduction of treatment for FAI syndrome, these authors would like to suggest the systematic, stepwise introduction of new surgical techniques. This method addresses the universal dilemma described by Malchau et al. [26, 27, 28], which is the unavoidable “gap” between the limits of non-human research and what will occur in humans after the large-scale, long-term application of procedures. The natural process of this introduction is gradually to reach higher levels of evidence while protecting patients from unnecessary risks, both the risk of changing technique and the risk of not changing technique. The first step requires the careful evaluation of possible preclinical approaches, such as cadaver, lab simulations or animal studies. The usability of preclinical testing may vary, but it is advised not to move on to clinical studies before preclinical testing demonstrates promising results, or preclinical testing is deemed unfeasible. The authors then suggest the implementation and publication of case reports with the meticulous evaluation of each case. If the results are promising, these single cases can be expanded to smaller case series with a gradual increase in cohort sizes. Later, retrospective analyses of these cohorts would be preferable, after which it is recommended that a prospective cohort study, with predefined inclusion and exclusion criteria, well-chosen endpoints and sound tools for evaluation, should be performed. To attain generalisability and to be able to identify the less common adverse effects, a multicentre register study is the next step. For the final step, after prospective cohort studies have demonstrated beneficial results, RCTs are the preferred method for comparing the new technology with old techniques, if any, and/or placebo. The crucial first step is the creation of a theoretical concept. This may be more or less abstract and theoretical. Its timing may be of importance, as some ideas may be too premature to be accepted by investigators and clinicians. The concept may also be questioned or rejected by established experts in the field whose authority and prestige in the area may be threatened by new developments. Terms that describe key concepts are presented and, in the FAI syndrome case, these terms include cam and pincer impingement. The well-cited paper by Ganz et al. from 2003 is a good example of a concept formation of this kind. At this early stage, clinicians and scientists try the new concept and report the results in case reports and small case series. There is a risk of report bias at this stage. This stage attracts “early adopters” who may have experience or characteristics to be able to try these new techniques. These characteristics may be positive, as these individuals may have the experience and skills to try new concepts in a safe way. They may also be negative and lead to incautious behaviour. In 2005, Sampson was the first to report on the arthroscopic treatment of FAI syndrome . At this stage, the ideas spread and more people try the new techniques. There is a rapid increase in the number of reports at international meetings. These reports focus on technical details, biomechanical studies, complications or new indications. Between 2005 and 2010, Ayeni et al. noted a fivefold increase in FAI syndrome-related publications. Early science often uses older outcome measurements. After the initial phases, there is a possibility of growing awareness that newer, more valid outcome measurements must be developed and used specifically to mirror the studied populations. New scores and classification systems may need to be created to match this need. A common language is created. To enhance communication between active researchers, subspeciality forums are created, such as the ISHA. Furthermore, to accommodate a growing scientific audience and an increasing volume of publications, speciality journals, such as The Journal of Hip Preservation Surgery, are created. In this phase, there is a need to corroborate early findings from small case series with larger case series of better quality. These may be retrospective, prospective or registry based and mirror the experiences acquired during the first phases. The Danish Hip Arthroscopy Registry was initiated in 2012 and is an example of a national register covering hip arthroscopy . Improved and newer outcome measurements are increasingly used. In this phase, it is important that the outcome measurements that are used are of high quality. In the case of FAI syndrome, many early reports used the modified Harris Hip Score (mHHS) as an outcome measurement, which has been shown to have low validity in measuring young and active patients with hip disorders . Later, in FAI syndrome-related publications, newer, more valid outcome measurements for the impacted patient population, such as the iHOT, HAGOS and HOS, were adopted. The concept has now spread and, due to the formation of a large body of science, certain degrees of consensus have been reached internationally. This is further enhanced by the rapid spread of information in the scientific community. In FAI syndrome science, the Warwick Consensus Agreement  is a statement of the current basic understanding of the FAI syndrome concept and its implications for patient care. Certain factors are needed to obtain high-level evidence in the form of RCTs. They include a common scientific language, a commonly accepted technique, valid outcome measurements and resources allocated due to the perceived importance of the concept. Due to the inherent difficulty involved in producing RCTs, such as cost, time consumption and difficulty recruiting patients, many RCTs are of poor quality. This creates a potential negative bias towards new techniques. On the other hand, RCTs are essential in minimising other kinds of bias. One of the first RCTs comparing surgical and non-surgical interventions for FAI syndrome was questioned for being of poor scientific quality . When multiple RCTs exist, there may be consensus on the benefits and shortcomings of the concept, through, for example, meta-analysis. If the RCTs are of poor quality, they may give rise to a false positive or negative result, depending on the outcome. With increasing experience, all concepts are subjected to possible revision or adjustments due to noted limitations based on new experience, technology and/or science. Concepts may be changed, disappear or reappear. One example is the recent re-emergence of the concept of the anterolateral ligament of the knee (ALL) and the lateral extra-articular tenodesis (LET) . Certainly, these phases overlap, but they follow a certain pattern, as parts of the knowledge produced at later stages of the stepwise introduction are dependent on the earlier stages. The different phases are presented in Table 2. Malchau et al. [26, 27, 28] argued for a direct transition from preclinical testing to RCTs in their suggestion for a stepwise introduction. As RCTs are regarded as a higher level of evidence than cohort studies in the light of EBM, this is an excellent aim. However, it can be argued that a few problems may arise with this aggressive, rapid approach when introducing new surgical techniques and a stepwise introduction involving cohort studies in the transition from preclinical studies to RCTs can instead be advocated. First of all, in the first step after preclinical studies, it may be too early for an RCT. To be able to perform a good RCT of a new surgical technique, several questions need to be agreed upon, such as the preferred surgical method and tools to evaluate outcome. Cohort studies are a natural way to explore these questions. Waiting too long to perform an RCT, however, may impair the preconditions necessary to perform a good RCT, as patients will most probably be reluctant to risk being randomised to non-treatment, when a well-established technique with good results exists. The latter may have been the case in the evaluation of arthroscopic meniscal surgery and ACL surgery. In a study by Sihvonen et al. aiming to randomise patients between surgery and physiotherapy for common degenerative meniscal tears, it took 7 years to include 146 patients, which is a long time, considering this is a very common condition. This may be due to the fact that arthroscopic partial meniscectomy was already established as the “standard of care” for decades and it was, therefore, challenging to randomise patients, leading to selection bias. One downside of early transition to RCTs is the risk of a negative result due to an inappropriate study design, outcome scores or immature techniques. The introduction and development of new techniques and concepts in medicine have been guided by a multitude of different paradigms and agendas. Some were justified by, for example, personal, economic, idealistic or altruistic considerations. Since the introduction of EBM, researchers have been aware of the need to follow certain scientific principles to validate the value and efficacy of procedures and treatments. The way this is performed follows a certain pattern in our scientific community, but it is not controlled by any one unit. Instead, it is composed of different players in our community: hospitals, industries, companies, government-funded entities, private individuals and so on. This uncontrolled development can, of course, be of benefit, as it follows an evolution-like development. It can also be hazardous, as non-beneficial agendas could have a negative impact on the field. This is of extra importance in the case of a medical procedure, as there is a window of opportunity in which to perform high-quality research, such as RCTs. It would, therefore, be beneficial if there was a general guideline for every actor in this evolutionary play to follow, so that the process is cost effective and time sensitive, and leads to useful answers for clinicians, health providers and, ultimately, patients. In this article, the authors propose a guideline of this kind as a way to think about the evolution of a surgical treatment, to understand the process and the steps that need to be taken next. The evolution of FAI syndrome has been a model for these guidelines. The reason may be that, during the evolution of the FAI syndrome concept and treatment, the scientific community has become accustomed to this progression and is aware of the scientific requirements needed to produce high-quality evidence. This development has not been perfect, but it has followed a pattern that has led to a development, seldom previously seen in the evolution of other surgical procedures. Key components in this development have been the definition of a concept, the development of an international society for spreading ideas and techniques, the birth of new specialised journals, the creation of international fellowships, together with courses and meetings. Furthermore, this has included the identification and validation of outcome measurements, retrospective and prospective case series and ultimately RCTs with good timing in relation to recruiting patients. The total timeframe for a stepwise introduction can vary, but a good final result should be more dependent on the quality of each step than any single step, such as RCTs. An example of how these proposed guidelines can be used is as follows. Imagine the introduction of a new treatment for back pain. The economic incentives for its increasing use would be great. Some interests would like to market these interventions as soon as possible, but, first, pathophysiological theories, complication rates and some efficacy studies such as case series are completed. Then, when it is shown that it is safe to use and appears to benefit some people, perhaps due to a real effect, a placebo effect or just a return-to-the-mean effect, it is widely dispersed. This has been the development process in many cases, but, in most cases, the efficacy of these interventions, despite numerous studies, time and money spent, is still not known. What if institutions, such as large health-care providers, follow the above-mentioned guidelines at an early stage, in the correct order, to achieve a rapid and successful evaluation? This includes the early creation and identification of appropriate outcome measurements, the creation of registries for prospective studies, the creation of international forums for spreading knowledge and progress, well-performed RCTs and, ultimately, systematic reviews of these RCTs. As this is a massive feat in overall terms, spread out over numerous institutions, that needs to be choreographed by an invisible conductor, the authors of this paper hope that the above-mentioned guidelines could serve as this kind of pathway. The consensus phase of this model rarely occurs in orthopaedics, due to the lack of multiple RCTs in many areas of orthopaedic surgery. In some areas, such as the treatment of clavicle fractures, there are multiple RCTs, but no consensus phase has as yet been reached, witnessed by the remaining diversity in its treatment. This lack of consensus might be due to a perceived gap between science and proven experience. This is a serious threat, as it jeopardises the meaning of the large body of work produced by the international community on the concept. This means that large, collective scientific efforts and resources go to waste. This is why a stepwise scientific model needs to be acknowledged to produce high-level evidence for the benefit of patients worldwide. There are limitations to these guidelines. The processes discussed here are inherently complex. As a result, even the process itself is subject to evolution and, in the future, the suggested guidelines will be improved. At this stage, the guidelines themselves are not subject to any scientific process but are in the early stages of concept formation. They could of course be examined scientifically. For article authors, a useful practice would be to state the phase of the stepwise process an article is in and how it contributes to the worldwide development of a certain scientific field. This would be beneficial to both the author, in planning the study, and the reader to readily identify the scientific stage of the article. The development of a new medical concept or procedure should follow a specific optimal process ultimately, in an evidence-based manner, to prove or reject its efficacy. This article presents guidelines for a development of this kind, based on the actual development of the science of evaluating treatment for FAI syndrome. Olufemi R. Ayeni is an educational consultant for the speakers bureau for Smith & Nephew and Conmed. Marc R. Safran is a consultant for Medacta and Smith & Nephew and receives royalties from Smith & Nephew, Stryker, Elsevier and Lippincott, as well as followship support from Smith & Nephew and Ossur.